A Halloween candy jar made from a clay pot, a clay saucer, an ivy bowl and craft paint. 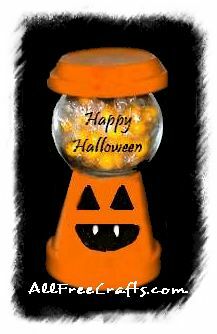 This craft project is similar to our Faux Gumball Machine, but painted for Halloween in pumpkin orange with a simple Jack O’Lantern face. 1. Paint the clay pot and clay saucer with paint primer, inside and out. Let the primer dry, then apply pumpkin orange paint to all surfaces and let this top coat dry as well. 2. Practice drawing a Jack O’Lantern face on paper. When you have created a face that you like, copy that design onto the upside-down clay pot. Use black marker or black craft paint to make the eyes and mouth shapes, filling in teeth with a small amount of white paint. 3. At this point, it is a good idea to apply a gloss sealer over the top coat of paint, but you may omit this step if necessary. If using, let the sealer dry completely before proceeding. 4. Turn the clay pot upside down. Apply a bead of clear silicon caulking around the bottom of the ivy bowl and center it on top of the pot. Set the glass bowl firmly into place then weigh it down until the caulking or glue sets (a heavy book set on top of the bowl should do the trick). 5. If desired, apply a decorative Halloween decal or stickers to the ivy bowl. This might be a saying such as “Happy Halloween” or “Trick or Treat” or it could be a traditional Halloween symbol such as flying bats or a witch on a broom. Fill the bowl with small candies or gumballs. 6. Place the clay saucer on top of the bowl as a lid. Simply lift the lid to dispense the candy.